Collection of sites promoting the AQHA cowhorse in breeding, showing, and sales. Standing AQHA stallions Doc Tom Peppy earner of the NCHA Certificate of Ability, and GR Desert Storm. Offpsring and prospects for sale. Standing AQHA stallions Doc Tom Peppy earner of the NCHA Certificate of Ability, and GR Desert Storm. Offspring and prospects for sale. Located in Herald, California. Breeding of AQHA cutting and reining horses. Features mares and foals plus horses and farm products for sale. Located in Pikeville, NC. Standing AQHA western pleasure stallion, Dynamic Deluxe, in Weatherford. Offers information about standing stallions and horses for sale. NFQHA national champion and AQHA versatility reserve champion standing near Kaufman. Offers breeding information and horses for sale. Standing at AQHA stallion Larks Gold. Site includes information about stallion and his offspring, breeding contract, and horses for sale. Located in Ford City. AQHA foundation-bred palominos, buckskins and duns with working and performance pedigrees. Stallions at stud, bred mares, weanlings and yearlings for sale. Auction service and horse breeder. APHA/AQHA registered foals and horses for sale. Photos and details on the horses. Small association for breeders located within a 10 mile radius in Southeast Iowa. Includes list of horses for sale and information about the members. Web ring with a few dozen sites. Classified advertisements dedicated to AQHA-registered horses. Class list and stall reservations. Located in Augusta, N.J. Breeding AQHA and APHA horses. Includes a sales list, photos, and animal profiles. Standing son of AQHA Champion, Genuine Hombre. Strock profiles, and photographs. Located in Albright. Breeder of quarter horses. Standing Two T Tough Steel, a black AQHA foundation stallion. Sales of western pleasure and all-around Quarter Horses including AQHA World Champions. Listing with pedigrees and photos. Located in Houston, Texas. Links of American Quarter Horse Association members web sites. AQHA High Point western pleasure stallion. Offers performance record, breeding contract, and foal showcase. Located in Cleburne. Breeding racing horses. Stock profiles, photographs, and sales. Located in St. Ignatius. Quarter Horse breeder standing son of AQHA Champion, Genuine Hombre. Strock profiles, and phtogrpahs. Offering APHA and AQHA horses and ranch tours. Includes a sales list, photos, and animal profiles. A non profit group that works with different local groups and 4-H organizations. HII also puts on a variety of horse shows each year. Including AQHA, APHA, Open, Futurity, and Fun Shows. If the business hours of Frosty Spring Stables in may vary on holidays like Valentine’s Day, Washington’s Birthday, St. Patrick’s Day, Easter, Easter eve and Mother’s day. We display standard opening hours and price ranges in our profile site. We recommend to check out frostyspringstables.com/ for further information. 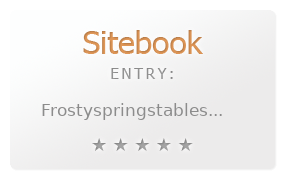 You can also search for Alternatives for frostyspringstables.com/ on our Review Site Sitebook.org All trademarks are the property of their respective owners. If we should delete this entry, please send us a short E-Mail.